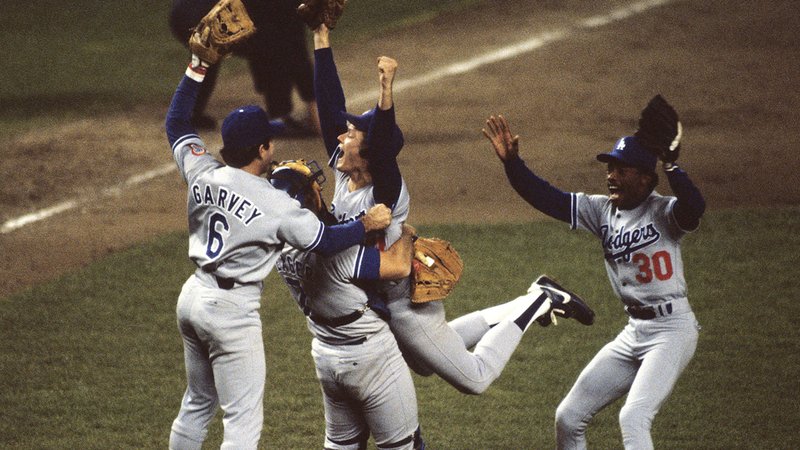 * An extra playoff series was added in 1981 because of a strike-shortened season. Yankees first baseman Bob Watson got things started with a three-run homer in the very first inning of Game 1, and the Yanks scored again in the third, knocking out Dodger starter Jerry Reuss in the process. With relief help from Goose Gossage, Ron Guidry picked up the 5-3 victory. Gossage was back in Game 2, combining with starter Tommy John for a four-hit, 3-0 shutout. With the World Series moving to Los Angeles, the Dodgers desperately needed a win. And they got it, scoring three times in the first inning on Ron Cey's three-run homer. New York went ahead 4-3 in the third, but the Dodgers tallied two in the fifth and held on, 5-4, with Fernando Valenzuela going all the way. L.A. evened things up in Game 4, but it wasn't easy. Dodger starter Bob Welch didn't retire a single Yankee in the first inning, but reliever Dave Goltz limited the damage as New York scored only twice. Still, the Dodgers trailed 6-3 when they came to bat in the sixth. Pinch-hitter Jay Johnstone smacked a two-run homer, and Bill Russell tied the game with an RBI single. And in the seventh, Los Angeles went up 8-6 on a pair of manufactured runs. Reggie Jackson homered in the top of the eighth to make it 8-7, but the Yankees could get no closer. The drama continued in Game 5, and once again the Dodger fans went home happy. The Yankees, though, grabbed a 1-0 lead in the second inning. It was still 1-0 after seven, with Yankee left-hander Ron Guidry working on a two-hit shutout. But with one out in the eighth, Pedro Guerrero and Steve Yeager lifted solo homers to left-center field, accounting for the 2-1 final, Jerry Reuss going the distance to earn the victory. The Series returned to the Bronx for Game 6, but the Bombers couldn't slow down the Dodgers, who rolled over the Yankees, 9-2 behind Guerrero's five RBI and the pitching of Burt Hooten and Steve Howe. The Dodgers were World Series Champions, thanks to four straight triumphs over their bitter rivals, the Yankees.